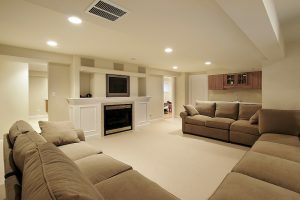 Basement finishing is a popular service we provide at PROTECH Home Improvements. Whether you need an extra bedroom, a playroom for kids, or a space to pursue your hobbies, or an additional bathroom, a properly finished basement can offer a practically endless amount of possibilities. Finishing your basement can also offer the benefit of an increased property value. As a trusted basement remodeling contractor, we’re here to help you make the most out of your space. When it comes to your basement finishing and remodeling, it’s crucial to make sure the job gets done right the first time around so your basement can provide you with years of enjoyment and functionality. There are many challenges that come with transforming your basement into a usable space, which include dealing with low ceiling heights, inadequate lighting, moisture issues and even emergency exits. Thankfully, our experts have a great deal of experience when it comes to basement finishing and make sure that every detail will be taken into account. We provide custom basement design services to be sure that your finished basement will be perfect for whatever use you are intending for it. Offering lighting installation, flooring, carpeting, insulation and more, we will be able to see to every detail. Basement waterproofing will ensure that you don’t have to deal with moisture issues which are so common with basements. If you’ve been thinking about what you can do with a finished basement, don’t hesitate to call the experts at PROTECH Home Improvements and find out what we can do for you. Whether you are looking to create an extra bedroom, home gym, playroom, bathroom, home office or more, the options for finishing your basement space are practically endless. PROTECH Home Improvements is here to help guide you from start to finish. Take your basement from unfinished to unbelievable with PROTECH Home Improvements!